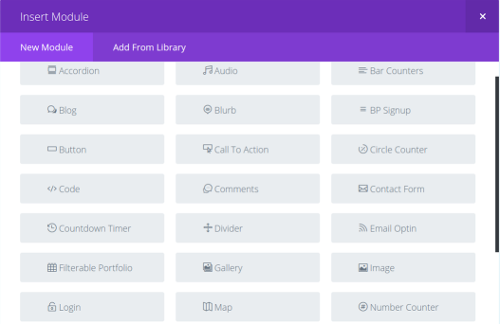 The Multipurpose BuddyPress Theme for the future! Most innovative, mobile first BuddyPress theme designed for great performance. Unmatched flexibility, infinite colors, highly optimized and feature rich theme for building BuddyPress sites. Get instant download & premium support! 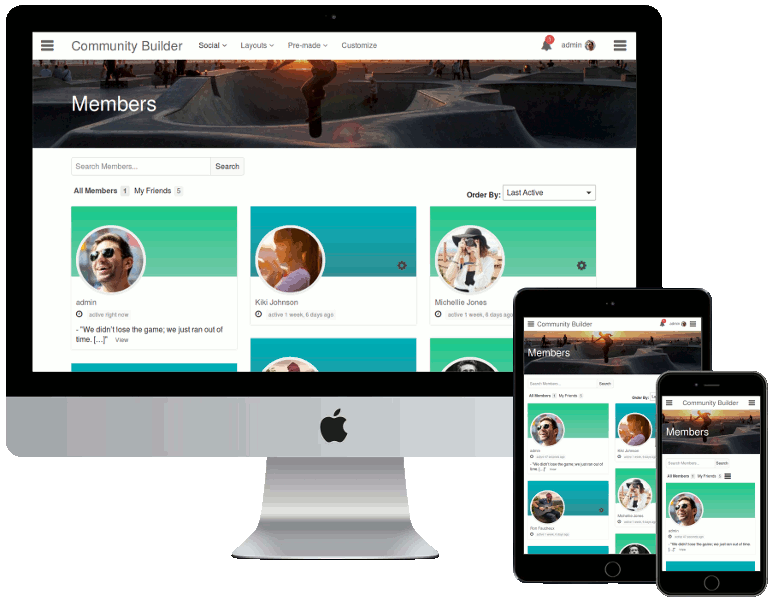 Community Builder is the most innovative, performance driven, mobile first, multipurpose BuddyPress Social Community Theme. It empowers you to efficiently create your BuddyPress communities quickly. With the live customizer and 100+ controls, you can create your stunning personal design. The theme is highly flexible and gives hundreds of options without compromising on features or performance. Community Builder Theme for BuddyPress is also the most cutting edge theme of current generation which empowers site admins to build clean and maintainable sites with high performance. If your goal is to create high quality social community sites, Community Builder will be a great asset. If you have ever used another BuddyPress premium theme and tried to customize that, you will love the simplicity and freedom of Community Builder BuddyPress theme. Great experience with WordPress. Use this theme to run a blog or your corporate site. It works beautifully with WordPress to provide your users an amazing experience. Community Builder is specially built for amazing BuddyPress Social experience. With 8+ years of BuddyPress knowledge, We aim to solve the quality issue with BuddyPress themes. Instead of just being visually appealing, Community Builder provides your with a strong foundation to create truly scalable communities. Though our integration with bbPress is not as amazing as BuddyPress, it is functional and better than the current market themes. Community Builder integrates nicely with WooCommerce. If you are creating a social site with BuddyPress & WooCommerce, Community builder will serve you well. With 300+ Controls, you can do almost anything inside the live customizer. Layout, header styles, theme styles, color controls, we have included everything you need to create a great WordPress, BuddyPress site. 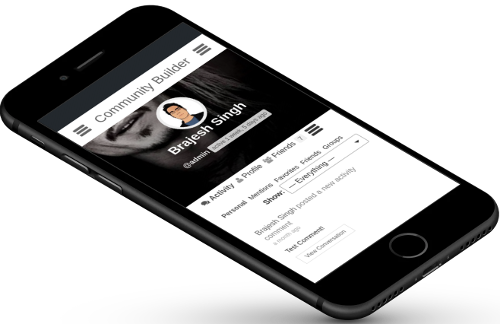 Community builder provides amazing, functional experience on mobile devices. Community Builder Comes with Maximus page builder(optional). Maximus is based on Divi Builder and provides great experience creating amazing designs. It comes packed with prebuilt 35+ modules and 20+ layouts, If you want to use any other page builder, community builder includes a fullwidth blank page template for that purpose. We have enhanced the BuddyPress members features and have added our own features which we consider important for BuddyPress. Sent pending request page for friends. Community Builder enhances the BuddyPress groups experience. It supports all BuddyPress core features and ads its own enhancement. Group Info page for single group. On top of the default BuddyPress/WordPress features, we have added certain enhancements to make the experience better. Lightweight, small memory and query foot print makes your site fly. SEO Optimized:- We planned structure and outlining. Community Builder provides two layout styles and three layout out of the box. Header, Footer, Sidebar can be hidden per post/page. Multiple offcanvas menu panel with complete display control. Flexible typography controls to create stunning typography. See Typography panel for all the available sections/options. Complete control over article meta using our innovative use of article meta shortcode. In this section, we list the options/features other than what we already covered in the layout section. Registration page can show the content added by you via the page editor. Single Group Info page to display group info. Added Requested Friendship page on the User->Friends to allow viewing all the members whom the user has requested friendship but they have yet not responded. You can style every single detail of your site using the Styling panel. The Community Builder theme comes with Maximus Page Builder( Optional, Based on Divi Builder). Please see the Maximus documentation for all the features it provides. We recommend Elementor Page Builder. Theme Styles:- These are extension of color scheme and allow you to control color, layout and all config. Google Fonts can be disabled completely. Member type ajax filtering on the directory.